The Green Mommy: Breastfeeding Still Taboo? Ever since Facebook changed it's policy on breastfeeding pictures many breastfeeding moms have been more bold about posting them. 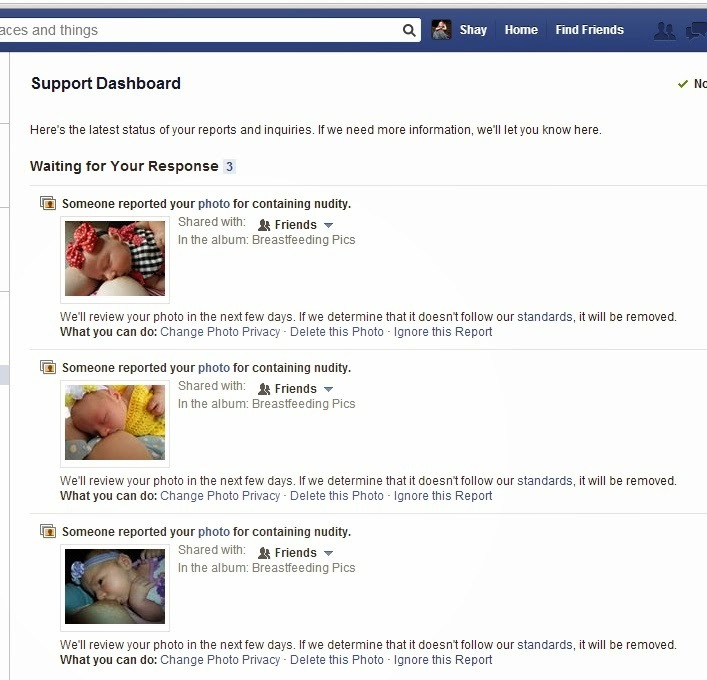 I have had an album up of pictures of me breastfeeding Bug since he was a baby (well before the policy change) and not one had ever been taken down or even reported. I felt safe sharing such an important aspect of what I felt for me was motherhood. So yesterday I posted a few new breastfeeding pics of River. I got a few likes and people telling me they loved seeing breastfeeding pictures on FB. So I was very shocked when I went back to check my page later and saw this. I was pretty shocked. My pictures can only be seen by my friends on my friendslist so I was surprised. All my friends are at the very least if not supportive of breastfeeding at least not anti it. Most everyone on my list is very pro breastfeeding. So I really have just no clue who could have reported me. However the outpouring of support was nice to see. I think as sad as it was to have a friend do that to me... it got people talking about breastfeeding. I guess to me breastfeeding in public is to feed my kid.. I am not trying to be showy or anything... just feed my baby. So why post pictures of it? To me posting pictures is for the same reason I post pictures showing milk I have pumped or my baby taking her first steps. It's to share a moment in motherhood that I am really proud of. I am very proud of overcoming the bumps I have had with River. I am very proud that Bug and I made it to 9 months of breastfeeding. I am hopeful I make it longer than that this time. I am proud of every once I pump and proud that my daughter is already about 10 lbs when she was 6 1/2 when we brought her home. I am proud that my son was 12 lbs by his 1 month appt when he was a little under 9 when we brought him home. I am very very proud that I can sustain them with my body. I do not judge those who can't for whatever reason or choose not to but that does not change the fact that I am very very proud of what my body can do. So I post pictures of that pride. I share that part of myself because it is an accomplishment and a moment of pure joy with my baby, captured, no less important than her walking or crawling. So I hope that before anyone ever hits report on a picture of a baby simply being fed from it's mother's breast, that you ask yourself the same question we teach our 4 yr old to ask himself before he does something, "will doing this hurt another person?" If the answer is yes, maybe don't do it. 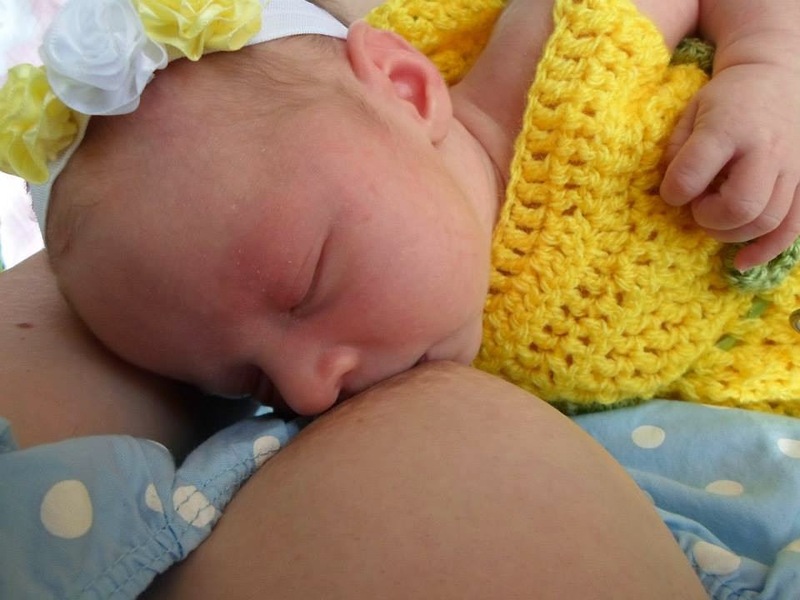 So in closing I am going to add a couple of my favorite breastfeeding picture of each of my kids. The first two are of Bug and the last two are of River. I share them with you proudly.